This is another great fudge taste sensation! Delicious fudge with a Cookies and Cream flavour, topped with a crunchy Oreo! Place the white chocolate in TM bowl. Blitz 5sec/Speed 9. Reserve the chocolate for later use. Add condensed milk, chopped butter, sugar, and glucose syrup to TM Bowl. Cook for 8mins/100C/Speed 3 (MC OUT). Scrape down the bowl being careful not to drip any condensation into the fudge. Cook for a further 16mins/Varoma/Speed 3 (MC OUT). Add the chopped chocolate, crushed oreo cookies and vanilla to the TM Bowl. Combine 20secs/Speed 4. Repeat this process until the chocolate has melted and is combined. Pour the fudge into the prepared tray. Decorate the top of the fudge with mini Oreo cookies then, refrigerate until set. Slice the fudge into squares. 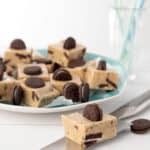 Add the Oreo cookies quickly to the top of the fudge as it will start setting immediately.